Ibarra and Central Christian are off to a big 2018-2019 season in 1A. Last season, Hutchinson Central Christian girls’ basketball went 13-10 and lost to Hartford in the first round of the Class 1A, Division II state tournament. 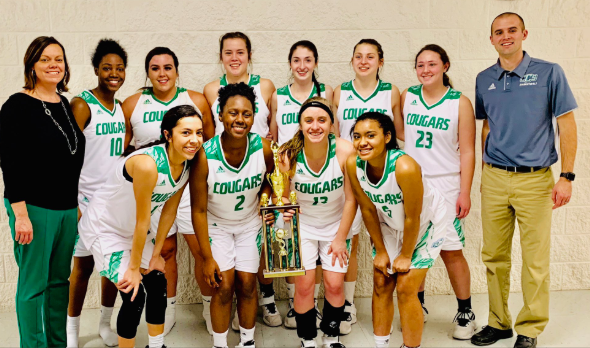 The Cougars have enjoyed a steady climb under Jason Hett, also the school’s sixth-year athletic director. Hett took over for Erin Patrick after 2012-13 when the program won just three games. Since then, the Cougars have captured two, eight, 13, 14 and 13 again last year. However, the Cougars struggled some in close games last winter. Central Christian went 6-7 in games decided by nine points or fewer. This year, the Cougars have 10 players on the roster and zero seniors. However, CC has improved and enjoyed a much better record in close games. The classification was split into Division I and II before it went back to one class this winter with 117 teams. The Cougars are 16-2 with several quality wins. In an extremely deep and talented classification that features multiple Division I/Division II prospects, CC was first ranked No. 10 in the Feb. 4 poll. The Cougars are 8-1 in games decided by nine points or fewer. CC has four juniors: 5-8 point guard/wing Josie Ibarra, 5-1 junior Taiyah Chapman, junior point guard Lindsey Kauffman, and 5-10 junior Krysten Bartlett. Sophomores Dazia and Ziya Simms and freshmen Leia Shank, Katey West, Aly Lambert and Sam Ramsey form the team. CC averages 40 points a game and Ibarra delivers 10.1 points, 6.1 rebounds, 3.9 assists and 2.1 steals. She leads the team in points and assists, ranks second in rebounds and is tied for second in steals. She also has a team-high 14 blocks and 17 threes. Ibarra has started since her freshman year, and Kauffman played often as a freshman. Ibarra ranks No. 9 in Kansas in assists per game, just behind Plainville junior Aubree Dewey, one of the state’s best players, according to the MaxPreps statewide list. Ibarra carries a 1.76 assist/turnover ratio, top-20 in the state. As well, Ibarra is a standout 1A track athlete who took fourth at state in the 800-meter run, fifth in the 400-meter relay and qualified for the 1,600- and 3,200-meter relays last spring. Bartlett has delivered 9.8 points, 8.1 rebounds, and Kauffman has chipped in 8.2 points and 2.7 assists. Ziya Simms, in her second year as a starter, has a complete stat line with 6.9 points, 5.3 rebounds, 2.7 steals and 2.5 assists. Central Christian opened the season 12-0 and took third in the Berean tournament in late January. On Jan. 25, CC lost 56-39 to Wichita Trinity, a Class 4A school, and then defeated host Berean, 37-31, on Jan. 26. Additionally, the Central Christian boys had to replace standout Nate Heneha. CC boys are 11-7 behind Adam Hall, an offensive talent, and Caleb Lambert, an excellent defensive player and the Most Inspirational Player of the Burrton midseason tournament for coach Adam Clark, in his 24th year with the program. Against Berean, Ibarra had 11 points, including 3 of 7 from beyond the arc, with five rebounds and four assists. Since 2010, Central Christian had been 1-4 versus Berean with three straight losses. On Feb. 1, Central Christian won at South Barber, 42-33, for another key victory. SB is 13-5, while Berean is 11-7. Since 2007, the Cougars had been 2-10 against South Barber and had lost six straight in the series before the victory. Versus SB, Central Christian held the Chieftains to 23 percent shooting, was plus-8 on the glass and had six fewer turnovers. On a per-possession standpoint, CC has been exceptional with defensive efficiency and has permitted just .49 points per possession, a mark under several 1A state titlists in recent years. Central Christian has turned the ball over on just 21.9 percent of possessions, a strong rate, and also recovered 31.2 percent of available offensive rebounds, a solid mark. Overall, Ibarra ends 14.6 percent of her team’s possessions and has a turnover just 15.1 percent of time.